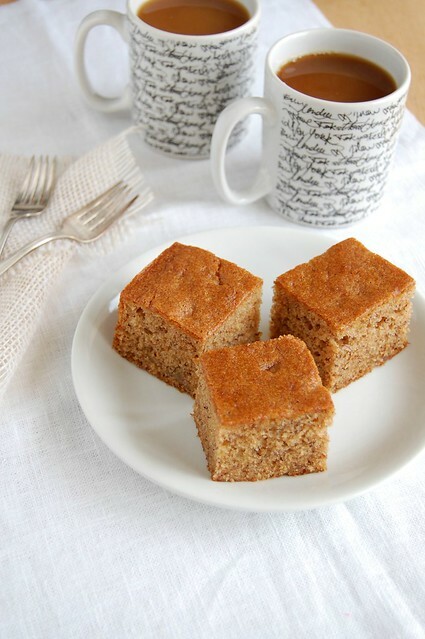 And just when I thought that Flo Braker’s banana cake would hold the title of “best banana cake ever baked in my kitchen” forever Mr. Dan Lepard showed up with the idea of caramelizing the bananas before adding them to the cake batter – how great is that? The cake turned out absolutely tender, with a deep, beautiful golden hue and a delicious, strong banana flavor. 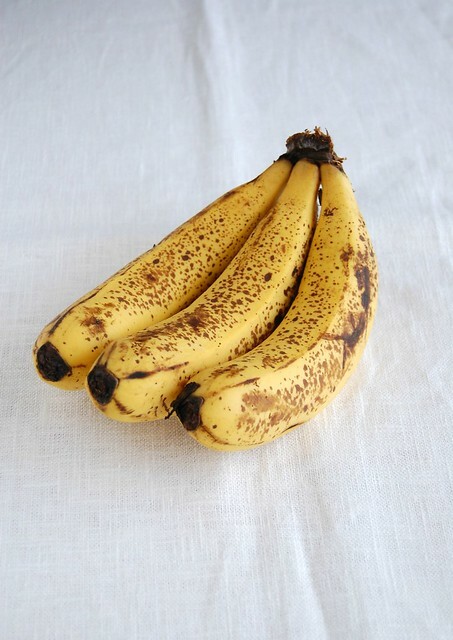 Make the butterscotch bananas: tip the sugar into a frying pan with the water and cook over medium heat stirring until sugar is dissolved – after that, do not stir again. Bring to the boil then cook over high heat until the sugar turns to a dark reddish caramel. Add the banana pieces, butter and vanilla – carefully, caramel may spit – and simmer, stirring occasionally, until the bananas break up in the caramel and the mixture is thick. Spoon on to a plate and leave to cool. Preheat the oven to 180°C/350°F. Butter a 20cm square pan and line the base with baking paper. Butter the paper as well*. Beat the sugar with the oil and eggs until thick and slightly aerated, then beat in the bananas, yogurt and vanilla. Sift the flours, cinnamon, baking powder, baking soda and salt together over the bowl, then fold this through the banana mixture. Spoon the mixture into the prepared pan and bake for about 50 minutes or until golden, risen and a skewer inserted comes out clean. Caramelizing or roasting bananas is the best! I recently made roasted banana bars, and I was pleasantly surprised by how delicious they were. I love your coffee mugs! More cake left for you!!! Butterscotch and banana! What's not to like? If I made this my boyfriend would find me slumped over the pan spouting butterscotch-addled gibberish with crumbs everywhere and a big dumb grin on my face. butterscotch & banana!! Its a killer combination! Love this cake! And I was kind enough to link to his book so people would be interested in buying it, like I did. Patricia, this looks DIVINE! Cannot wait to try! I'll be making this ASAP. And guess what Miss Patricia! I just saw your feature on DESIGN SPONGE!!! Wow!!! Good for you!!! 2) That cake looks amazing, I pinned it quick as quick. 3) I wrote a comment about you because I was so excited to see you there! So happy to see your face, you are so darling! I love banana cake, but nver add cinnamon to it. I should try...!!! This could be a great cake!! I'll have to try it!!! I made this cake today and it came out great! I made it in a 9" round cake pan and it just fit. I put some homemade salted caramel on top after it had cooled. It was fantastic- really nice moist crumb and excellent flavor. It's a favorite. Thank you! I'm so glad to hear you liked the recipe! Thank YOU for letting me know - I love the idea of adding salted caramel to this cake, it's genius!